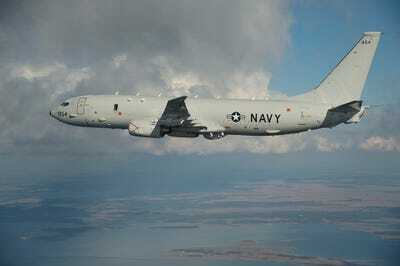 Boeing’s P-8A Poseidon has been a part of the US Navy for a year this month. The converted airliner brings the latest in anti-submarine capabilities, reaching greater altitude and speed than its predecessor (without the nausea factor for its crew). At the front of the plane, the P-8A sports an exclusive radar system supplied by Raytheon. In certain detection modes, the 408-pound radar system has a range of 200 nautical miles and provides ultra-high resolution images. A shorter-ranged setting offers enough precision to pick up on “small targets with limited exposure time in high sea states,” according to Raytheon’s fact sheet on the product. The P8-A also has a refueling receptacle for missions that go beyond the 20 hours it can fly on a full tank. The back half is dedicated to the storing and launching of sonar buoys from on high, which allow members of the nine-person crew to measure the sound propagation around these underwater units — just as a submarine or warship typically would. The P-8A can send out more than 100 of these yard-long “sonobuoys” in a single flight. And in the middle, “any operator can control and monitor any sensor from their station,” a Boeing representative wrote in an email to Business Insider. Each of five operator stations is equipped with two 24-inch high resolution displays, which were designed to work seamlessly with Raytheon’s radar system. Unlike some vehicles contracted from private manufacturers, the P-8A’s militaristic features “are incorporated in sequence during fabrication and assembly” rather than being tacked on in post-production. It’s built from the fuselage of Boeing’s 737-800 and the wings of its 737-900. 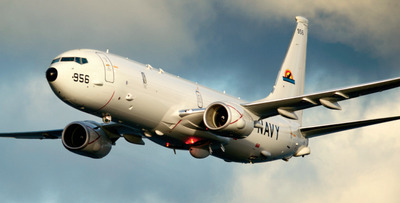 The US Navy currently owns 13 units of the P-8A, with plans to eventually expand its stable to 117. Already the plane has played a role in the South Asian theatre, where China’s confidence in laying claim to disputed islands and waters meets a US presence meant to strengthen ties with nervous allies. In August a Chinese fighter jet performed several passes — and even a barrel roll — near and above an American P-8A flying some 135 miles east of Hainan, home to a Chinese submarine base. At the time, China said the pilot had kept a safe distance, while the US described the event as dangerous. In talks that raised the incident earlier this month, China and the US agreed to new guidelines aimed at avoiding further friction, including notification requirements and rules of behaviour for future encounters. The P-8A doesn’t just make spy flights; in addition to its primary function as an intelligence-gathering asset, it can carry various payloads: cruise missiles, naval mines, and even torpedoes. Boeing has also created the P-8I, a variant on the Poseidon designed for foreign markets. The Indian Navy has purchased eight of these, the last two of which will be delivered next year, to replace their Russian Tu-142 aircraft. According to Boeing, the company is fielding interest from other countries as well; Australia has moved to acquire eight of its own. India’s P-8I, per their contract request, is equipped with a Magnetic Anomaly Detector (MAD) eschewed by the plane’s parent version. The tailpiece picks up on variances in the Earth’s magnetic field created by large metal objects (like submarines). India’s own group of planes may go towards monitoring the same rival its American cousin does. “Indian strategists speak in alarmist, geopolitical terms about a Chinese footprint in India’s sphere of influence and a possible encirclement,” the Stockholm International Peace Research Institute wrote in March. “They call for a speedy and forceful investment in a blue water navy.” For that, Boeing’s latest surveillance aircraft could make a strong complement. This post has been updated from an earlier article on the P-8 series, which drew inaccurate information from the Reuters graphic.